When the Big East reconfigured and returned to its roots as a basketball-first league in the 2013-14 season, the Villanova Wildcats became the dominant force as they won the previous four regular season championships. Things appeared to be smooth sailing towards a fifth, but the improved depth in the league witnessed the rise of the Xavier Musketeers to the mainstream after being the last Big East team standing in the 2017 NCAA Tournament (Elite Eight). The Musketeers (27-4, 15-3 Big East) swept seven teams in league play on the way to their first outright regular season conference championship since the 2010-11 season as members of the Atlantic 10 in a 65-62 win over the DePaul Blue Demons on Saturday. The road to an undisputed championship in league play came with adversity. The Musketeers appeared to be on cruise control with a 5-0 mark and a top 20 ranking to start the season, but hit a bump in a 102-86 loss to Arizona State on Nov. 24. Despite the loss, coach Chris Mack kept the ship afloat as they reeled off wins against Baylor and Cincinnati and went into league play ranked No. 6 in the Associated Press poll. Things appeared to run smooth as Xavier won three straight games to open league play, but managed to hit another pothole with back-to-back losses on the road to Providence and Villanova. 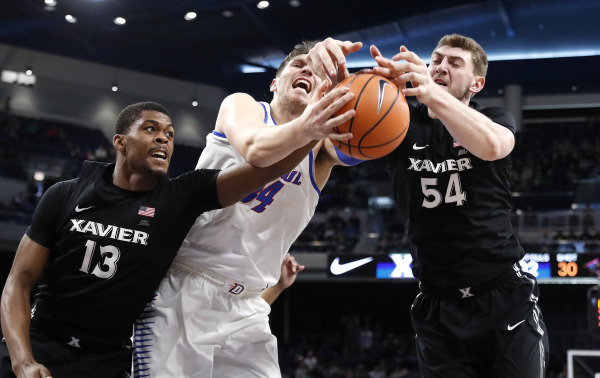 The Musketeers could have decided to crumble and fall into a six-game losing streak similar to last season, but the experience of seniors like J.P. Macura and Trevon Bluiett would not allow the same fate to occur as they reeled off a nine-game winning streak. “We had six losses in a row last season and Edmund [Sumner] went down and Trevon got injured for a bit, which didn’t help,” Macura said. “This season has been different with winning more, but we still needed to win this game at DePaul to stand by ourselves as Big East regular season champions. Mack acknowledged Xavier’s struggles last season, but helped them grow into a position where they could make another run deep into March. “Last season was a weight lifted off our shoulders in the NCAA Tournament as we played like a group that was out there playing for one another with no regard for being reckless,” Mack said. Loaded from top to bottom in terms of skillsets, National Player of the Year candidate Bluiett has led the way for Xavier with a team-high 19.3 points per game, highlighted by a 37-point performance against Seton Hall on Feb. 14. Any team with Final Four aspirations needs a change of pace guy and J.P. Macura fits the mold for the Musketeers. Macura, along with Bluiett have been side-to-side for the last four seasons and have amassed a combined 3,614 points as of March 3. Mack praised the influence Macura and Bluiett have made on the Xavier underclassmen. For the Musketeers, being able to get past the vaunted Wildcats would be the last step towards solidifying themselves among the elite in the Big East.